The artist Grayson Perry recently completed a cycle of six giant tapestries, The Vanity of Small Differences, inspired by William Hogarth’s The Rake’s Progress. In the Turner Prizewinner’s modern rendition, Tim Rakewell (like his Georgian counterpart Tom Rakewell) undergoes a social transformation from humble origins to landed gentry. In Perry’s version, Tim’s life course is transformed by university education and a self-made fortune in computers – which catapults him socially from his humble origins in a Northern council house, via the bourgeois confines of middle-class dinner tables, to owning his own country estate. Like his eighteenth-century namesake, Tim meets an untimely death — not from syphilis, but through another, more contemporary hazard resulting from a ‘fast’ lifestyle — a crash in his Ferrari. Like Hogarth, Perry ingeniously constructs a modern morality tale that captures the spirit of the age — in Hogarth’s day, advantageous marriage; in our own time, fascination with wealth and celebrity culture. One of the most compelling aspects of both artists’ work is their eye for the design of everyday objects and what they convey about their owners’ lifestyles and identities. From geegaws to grand purchases, fabrics to foodstuffs, the choices we make locate us in modern consumer culture as part of a particular tribe, group or class. Their condition, use and juxtaposition are invested with human drama and emotion. In Hogarth, a wrecked marriage is indicated by an upturned mahogany chair; in Perry, violent death is present in a smashed iPhone. Through a riveting series of television programmes for Channel 4 about the making of his tapestries, Perry excelled in casting a non-judgmental, even quasi-anthropological eye over the habits of each ‘tribe’ he visited in search of inspiration — from grannies’ front parlours (with their china cabinets and horse brasses) and working men’s clubs in Sunderland, to the game larders of the Cotswold gentry. Among the middle classes he contrasted those he met who were affluent but who had no particular views about taste of their own — who effectively outsourced their consumer decisions to the builders of executive-style homes with luxurious magnolia interiors (ready furnished) — and those for whom ‘cultural capital’ was important. Among a certain section of bourgeois consumers, each Farmers’ Market purchase and shabby-chic item artfully placed at home becomes a marker not only of taste, but of sound morals (supporting local producers, buying Fairtrade products, demonstrating ‘good taste’). Not so those who inherit wealth in modern Britain — whose loyalty to their tribe is demonstrated by appropriate dress — consisting where possible of hand-me-downs from their great-grandparents, and favouring durability over the whims of shifting fashions. Perry depicts the latter group as a wounded stag with a human face, under threat of extinction from the harsh realities of economic change and onslaught of new money (Tim Rakewell at the gate with his chequebook). It is a certain type of middle class person who emerges from Perry’s study as the most anxious about taste, probably because of its close association with morality among this particular tribe. ‘Bad’ taste isn’t just about choosing the wrong wallpaper if you believe that it is an expression of your cultural capital and social aspiration: it’s about whether you are a good person and the ‘right kind’ of person. In this, the twenty-first century bourgeois (southern?) English are the direct inheritors of their Georgian ancestors’ view of taste. For it was only with the rise of modern consumer society that such things came to be of consequence to people beyond the ranks of the gentry and aristocracy, who in previous generations had pretty much preserved their monopoly on consumer choices owing to their stranglehold on wealth and power. Personal preferences came to matter only when markets diversified (more stuff available), specialised (more ingenious stuff available), and produced goods that became more affordable (more cheap stuff). Added to this was better transportation by road, sea and canal — later railways (easier-to-get stuff). Novelty became a major factor in the desirability of consumer goods (exotic stuff). Through this new world of exciting goods, ordinary people with a little more disposable income to spend (which varied according to other factors, like the price of basic foods), sought guidance on how to acquire and exercise the faculty of taste. Access to books, art, and music was no longer confined to the very wealthy. Certain rules made it easier, provided consumers boned up on where to look and what to buy from an authoritative source, like the vastly popular Spectator, published in the early years of the eighteenth century by Joseph Addison and Richard Steele. As far as music went, for much of the century, Georgian consumers mostly thought that Italian music was good taste, though connoisseurs debated about which composers expressed the finest sentiments. If all else failed, and Italian opera in its earliest imported forms proved a little too florid, Handel reassured the English with royally-approved reworkings, adapted to suit the more austere taste of the Hanoverians. Unlike Grayson Perry’s findings about contemporary Britain, where the taste of the gentry is defined by inheritance and continuity, the Georgian gentry were much more innovative and experimental, inspired often by their experiences on the Grand Tour. The great era of country house building between 1680 and 1730 brought to the British Isles new architectural styles that are still traceable in the neo-Classical porticos and faux PVC sash windows that adorn modern executive homes. Perry’s insights resist the idea that there is any such thing as bad taste — merely that taste is tribal and profoundly linked to where we come from and whither we aspire. Taste and morals aren’t necessarily linked – but perhaps, in an age of growing awareness about the finitude of global resources, the process of highlighting the political dimensions of consumption isn’t necessarily a bourgeois failing either. Helen Berry is Professor in Early Modern History at Newcastle University. She is the author of numerous articles on the history of eighteenth-century Britain, and is the author of The Castrato and His Wife (2011), which is now available in paperback(2012). If you liked this, try Helen Berry’s OUPblog articles on why history says gay people can’t marry and an analysis of Royal weddings. 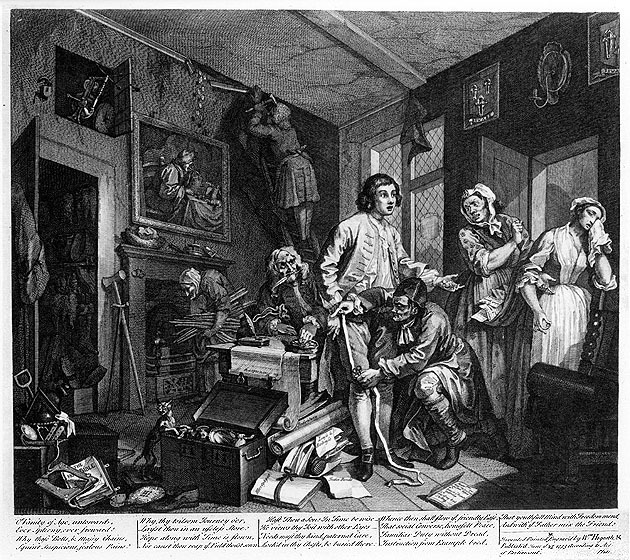 Image credit: A Rake’s Progress by William Hogarth, in public domain. Source: Wikimedia Commons.